The Ice Princess Collection is inspired by the Disney movie, Frozen. Each of the polish names are from quotes in the movie. The whole collection is a set of ten different polishes. I have seven of those to share with you so be sure to check around more blogs for the other three: The Sky's Awake, Queen Arandelle, and My Own Personal Snow Flurry. This is the first time I've tried this brand, and I think I'm in love! Each polish's formula was perfection and the flat brush allows for precise control of the polish with minimal clean up afterward. The color descriptions were provided by Theresa from Grace-full and my comments will be underneath. 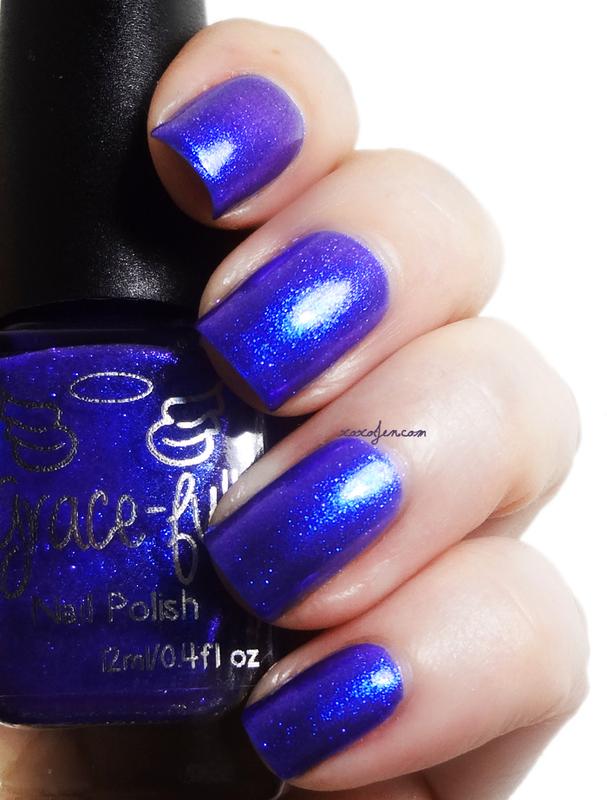 The blue flakies in this are a sapphire shade and micro-sized for that hidden oomph that makes you wonder 'what's in there!?' I used two coats for opacity. I enjoyed wearing this one because it kept me guessing! The holo flame really plays tricks on my eyes - is it purple? pink? smokey? It's all of that and a bag of chips. I wore two coats and added a few extra strokes to insure vnl was covered for the images. 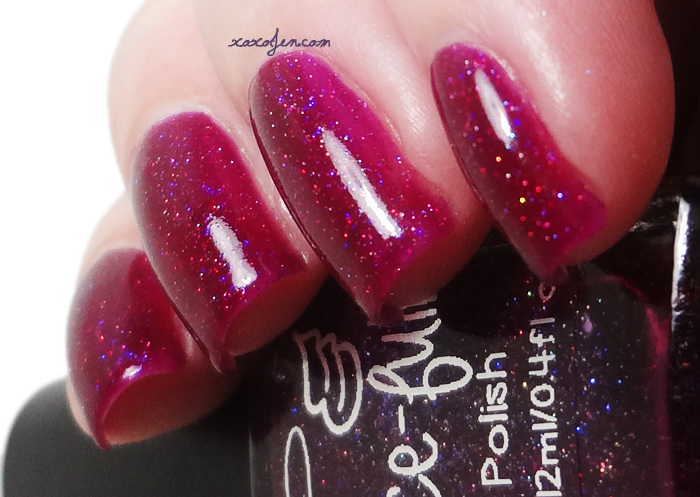 Beautifuler – a deep pink jelly with ultra fine pink holographic glitter and iridescent violet glitter. Oh man, the squish! the shine! the depth! the sparkle! What else could a gal want? This one does appear darker in the bottle, but once it's on the nail it's a beautiful cherry berry shade! I used two coats for the photos. Stunning in the bottle and on the nail! In some lights it looks metallic and sometimes super shimmery. 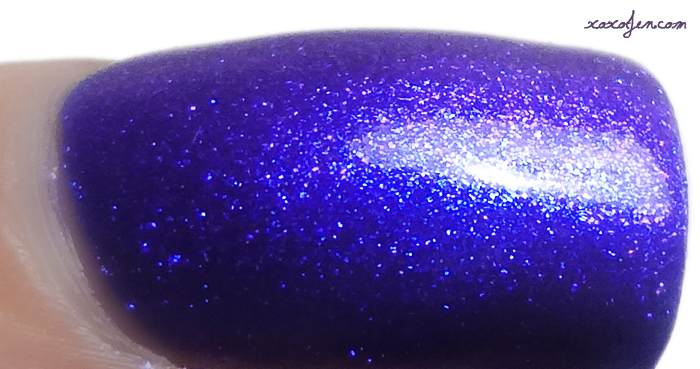 It's blue but the purple shimmer that it's packed with plays tricks on the eye. Definitely one you'll want to observe in different lighting situations while wearing it. This was my favorite of these so I'm wearing it all week! 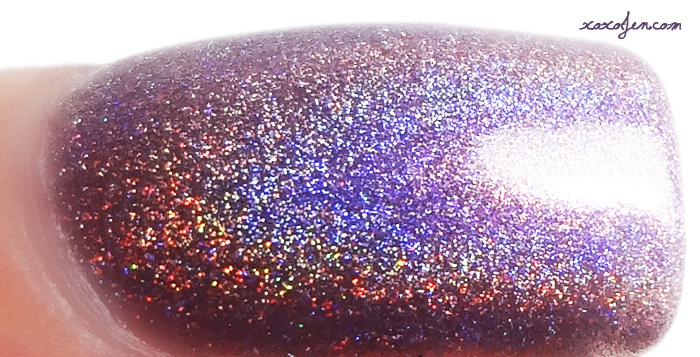 Little Baby Unicorn – a mauve super holographic micro glitter with violet holo microglitter in a jelly base. 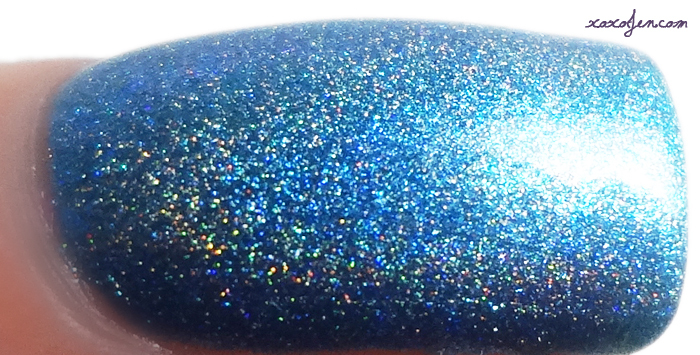 This is the glitter cousin of Open Door, similar in shade but so different in finish! I wore two coats for the photos. Ice Crazy – a grey crelly with a hint of blue throughout, ultra fine silver holographic glitter, iridescent tiny glitters and little flecks of mauve and blue. Beautifully done dove grey shade with heaps of purple/blue shimmer. The shimmer in light shades are typically very difficult to capture, but I did my best! I wore two coats, no streaks. This blue may look very similar in color to the one above, but I assure you - they're different! This one is just slightly lighter in color and is metallic! 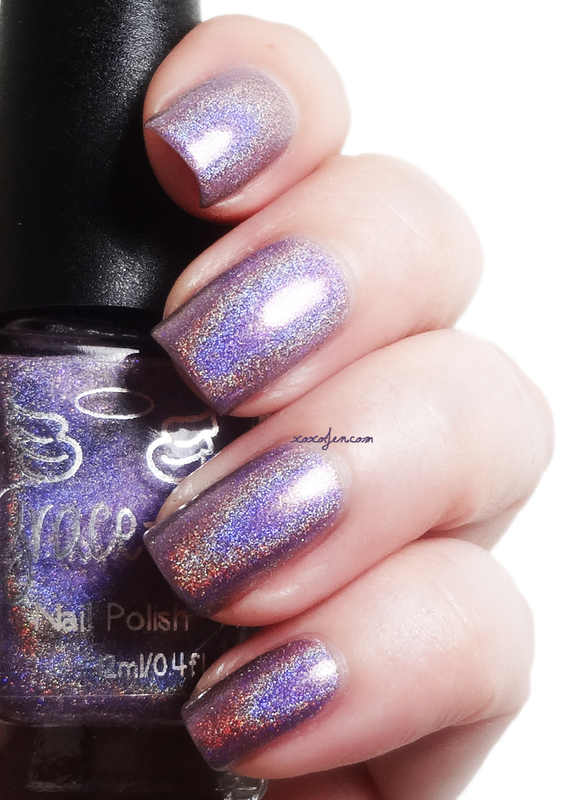 It has a lot of sparkle in dim light and then goes crazy in the sun with a fiery holo flame! Two coats used in the photos. if you buy 4 or more bottles from the Ice Princess collection you'll receive a bottle of Magical Snowflakes. In a clear base it is loaded with violet-blue shifting and rainbow iridescent glitter in all sizes as well as white matte snowflakes. You can see a photo of it at the Grace-full Facebook page! Don't forget to surf around for the three shades that I didn't have, they're equally as pretty! So pretty! 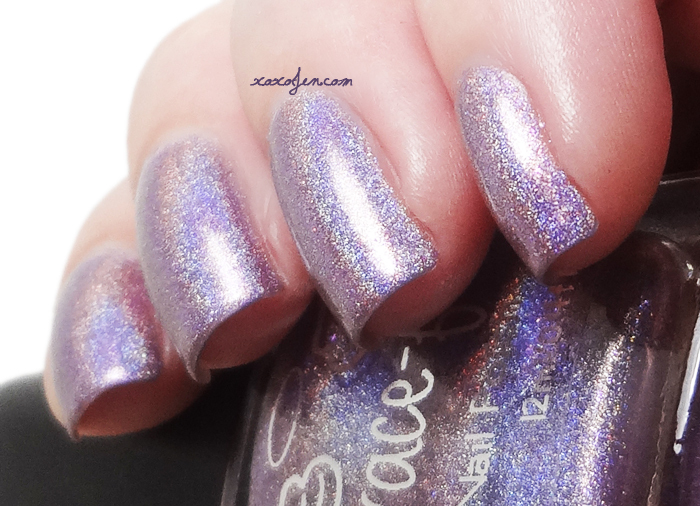 I'm loving those holos! These are amazing, and your swatches and reviews are wonderful. Love your nails too, Jen. They make me jealous.